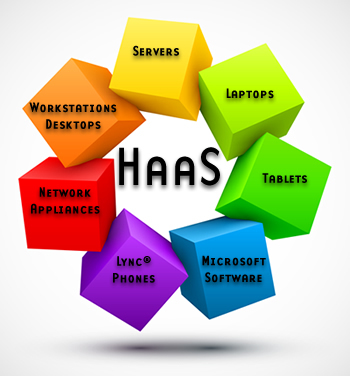 Hardware as a Service, also known as (HaaS), provides your business with the ability to provide a complete end-to-end managed service solution, which can include anything necessary to bring a client’s network into today’s technology. This can include servers, desktops, notebooks, infrastructure components, licensing, and much more, all in a monthly, recurring revenue based solution, with no up-front costs. Because our services are fully scalable, you’ll never have to worry about an IT cost you can’t cover. With no additional IT staff needed and no initial capital investment required, you can now direct your cash to more important, business growing prospects, and leave the little things to us.